Way back when, the Missus used to make me drive up to Oceanside for Kelaguen from Guahan Grill. That went on for a couple of weeks; until we had two pretty bad meals....which had me making my "Kind of Kelaguen and Fast Finadene" from that point on. Back in January, Guahan opened a location in the Midway area and I put it on "my list" for a visit. For some reason, it took me like 6 months to finally drop by. Sorry about the photo of the sign. There was a giant semi parked in front of the place during my entire visit. I like the set-up here. Bright and wide open, almost looking like a "gastropub" of sorts. I basically went with the exact thing I ordered during my first visit to Guahan...way back when. The combination Pork Ribs with Kelaguen (of course)....called "Guahan Special", this came with a salad and empanada. Of course I had to taste the Finadine, which was pretty good. Much better than what we had during our last two visits to the Oceanside location, which was almost all soy sauce, barely a hint of sour. I do like my finadene a bit more sour and spicy. So I asked for some boonie peppers, but they were out. Bummer. There was of course red rice, nice textures, mild in flavor, livened up with finadene. The empanada was not as good as I recalled; crisp, but with hardly any filling, which was very bland. The kelaguen was also pretty bland; I taste ginger in this, no coconut, no spice, kind of dry.....it really needs the finadene. The pork ribs were as I remembered, perhaps even better, as the meat came off the bone cleanly. These were far from bland, edging on salty....but I was pleased with them. My Server, a very friendly and pleasant young lady, Brazilian I believe, was a joy. So yes, I'll be back. I need to try some of the items on the menu. Especially since I don't have to drive up to Oceanside any longer. I'll have to see if I can talk the Missus into coming. With the state of kelaguen in our household, that's going to be a challenge. Speaking of a challenge....this shop is hidden behind from Rosecrans in the same building as Native Foods and Pick-up Stix, next to Yummy Buffett. Man, talk about setting the bar low in this strip mall....though I know folks who like the Gourmet Bagger. I really don't get up to Oceanside nearly as much as I should. I haven't been back up here since I visited Panca last October. 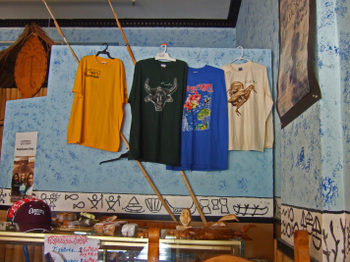 Recall writing about the not yet opened Guahan Grill back in September of 2010. Time sure does fly....though I hadn't forgotten about the place. Recently, I was up in the area right at lunchtime, so I thought I'd check the place out. I enjoy the bright colors of the restaurant, simple furnishings, a bar area, looking a bit smaller from the interior than I thought. As bright as the colors of the restaurant was, the young lady who served me shone even brighter. I believe her name was Karen. She was just perfect for a place like this; friendly, casual, and laid-back, but still professional. As the name indicates, the food here is Guamanian/Chamorro influenced, but also with some updated items like the "Guam Bomb", Guahan's version of Fries topped with barbecue chicken, melted cheese, and spicy mayo and Poke Tacos. Karen instantly endeared me to her by bringing out a nice bowl of that wonderfully salty-sour-tangy condiment called Finadene. I've made the claim that I could eat cardboard with finadene. I really liked the version here, it had a nice zip....I could probably do shoe leather with this one! She also asked if I wanted boonie peppers, the answer was of course an immediate "yes"! The plate was pretty large and the variety was enough to keep me interested. So, it's off to the races....the kelaguen, probably my favorite Chamorro dish as I've as I've mentioned before. This version was a bit bland without the finadene and the chilies. Everytime I write about kelaguen, I harken back to the amazing version my friend;s mom made back in Hawaii or Santos's version, so I'll spare you this time around. This just needed a better flavor base, though the finadene saved it. Loved the texture of the red rice, though it was very mild in flavor until......yeah, you've got it, I hit it with finadene. The empanada was nice and crisp. The chicken filling was very moist and tasty....sort of pulled chicken if you will. A bit mushy in texture, but nice flavors. The biggest and most pleasant surprise were the barbecue spareribs. While these weren't the "pull the bone out cleanly" ribs, it was sufficiently tender. Nice fat, decent texture, the flavor was a nice salt and a touch of sour. Of course the finadene just made them that much better. 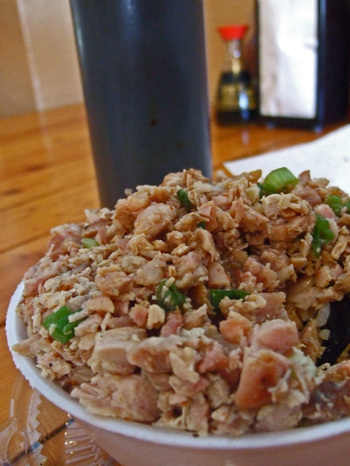 Back in May when we were on vacation in China, Cathy did a post on Chamorro Grill. I hadn't had anything that could be remotely called Chamorro for a while, my last few visits to Islander Grill were less than stellar, so I hadn't been back in two years or so. So naturally, after reading Cathy's post (and please check out her post) upon our return I dropped by Chamorro Grill. The interior is spartan, but very bright and clean. During my visits I tried a couple of dishes that Cathy has already covered, so I didn't bother to take photos. I will say, that on my most recent visits, the Garlic Shrimp in Crab Fat Sauce has been replaced with Garlic Shrimp. If there was one dish I had to try, it would be the Kelaguen Manok.... now it would be nice to have something like Kelaguen Katne (Beef Kelaguen), a dish I would liken to Koi Nua or Lao Beef Larb; basically beef "cooked" in lemon juice. Or perhaps, Kelaguen Uhang (Shrimp Kelaguen), which was described to me as being like ceviche the first time I heard of it, but would probably say perhaps even Aguachile nowadays. I was pretty sure that this Chicken Kelaguen would not match what a friend's Mom made for us over a decade ago, finely chopped chicken, a good amount of heat from red chili peppers, onions, scallions, and most interestingly, grated fresh coconut. All made wonderfully addictive with the juice of calamansi. See Santos' recipe as a point of reference. Of course, after ordering the Kelaguen Rice Bowl ($5.99), I really didn't expect that, and of course that's not what arrived. 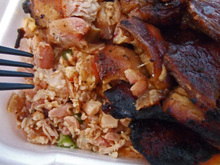 Here, as with Islander Grill, it is grilled chicken, or as it is called, "Barbecue Chicken", which has been chopped and mixed with scallions, and flavored with a mildly spicy and sour sauce. It was more moist than the last few versions I had at Islander Grill, but very similar. The red rice, calrose rice colored with annatto/achiote/achuete/bijol or whatever you want to call it, was well cooked. Many versions are too mushy, but you could count every grain. 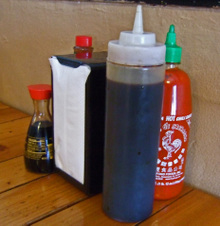 What really makes this dish for me is the Finadene, a salty-sour-spicy sauce that I could pour over cardboard and enjoy. While the dish is packed into a little styrofoam container, it ain't so little. I could barely finish 3/4 of this before having to call it quits, and take it home.... along with about ten little containers of Finadene. While not stellar, it did fine by me. A couple of notes; there are always specials written on the small greaseboard next to the cash register. Everything is made to order, so sometimes food takes a while. mmm-yoso!!! is a food blog. Kirk usually writes here, but he isn't here right now. He is in an exotic land far, far away. Well. The land may not be exotic, but is far away for some of you and the food he is eating is exotic. In the interim, Cathy is talking about her foray into exotic. Hi. The other day, The Mister and I were driving along Mission Gorge Road and saw the two end buildings at the NorthEast corner at Zion had changed ownership last year and we kept forgetting to stop. At this point in time, we were both hungry. We remembered to stop. I was not interested in the Hula part, but the "Island Barbeque" sign caught my eye. 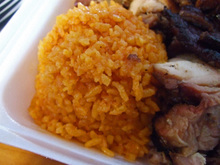 Basically, Chamorro means Guamanian food. The Mister had spent quite a bit of time in Guam and said Guam had the best food, and he thought it was the first place he had had poke. I figured I could get poke if nothing on the menu seemed interesting. Well. No poke on the menu. Different island food here. But interesting looking items. Decor was Philippines, Guam and Hawwaii... We went inside. We placed our order, paid, sat down and waited. 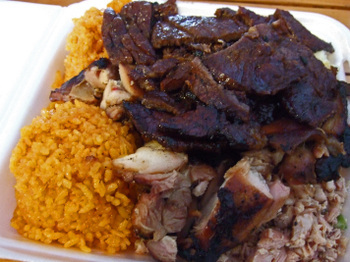 The good thing about Chamorro Grill is that your food is made to order. The only bad thing about Chamorro Grill is that your food is made to order. Many people came in to pick up phoned in/to go orders. There had been 5 tables with people eating when we came in. We watched the television, read a copy of The Reader and pondered a lot about that door to the right. The one with the red sign "Employees Only". The door which cannot possibly open fully. See the wall behind it, the wall with the clock, the 12 inch wide wall employees walk around to get to the kitchen? The wall with a door. We pondered that little sort of storage area a long time. It was worth the wait. The lumpia ($3.25), which we ordered as an afterthought, were home made, filled with ground beef and peas and a nice spice. We got 5 and not 4, as the menu stated. Perhaps because we were waiting. These were prepared last and were very hot. We could not eat them for a while. But they were fried properly-crispy, not greasy. Again: made here, not the frozen ones you can buy at the Asian Market. I wanted to try the Kadun Pika ($6.50). Chicken in a spicy coconut sauce. Boneless, skinless thighs, at least two thighs, possibly three. The menu says braised chicken...in any case, moist and flavorful meat. The sauce did not have any hints of coconut, but was thick (not from cornstarch), tasty and had some very nice heat to it. This was served with Calrose rice- with a hint of achoete (achiote?). Menu says the rice is cooked with garlic, onions and other spices, but it wasn't. I think if it had been, that would have contrasted with the pika sauce. Next to the cash register there was a board listing 'specials'. The garlic shrimp cooked in crab fat ($7.95) caught my eye. Crab fat, sometimes called crab paste, is sold in jars, not refrigerated. I have seen it at most of the Asian markets around here. I never bought it. I should have. I will. The flavor of crab fat is ...crab. Buttery, concentrated crab. The very large, plump, fresh shrimp(7) in this dish still had the fresh shrimp flavor, sauteed in garlic. The sauce had the most wonderful butter-garlic-crab flavor and lots of canned mushrooms. We spoke to the cook-chef, who was very happy we had ordered and really liked this dish. This is a very nice place, the people working here are very friendly and the food is excellent. To say that Islander Grill is in an "interesting" location would be an understatement. 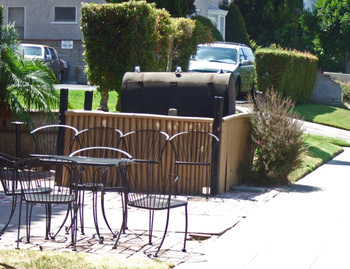 The little restaurant is located in the Embassy Hotel on Park Boulevard. 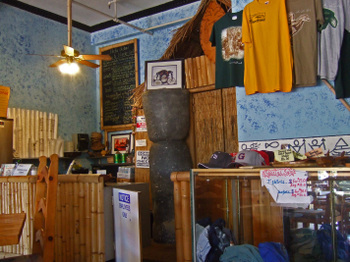 The interior of Islander Grill is full of Guamanian knick-knacks, and presents itself as sort of a tropical-kitsch. 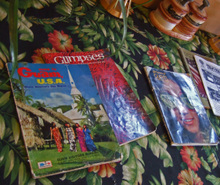 On this day, the restaurant was pretty well organized, with everything, includi ng the Guamanian magazines and pamplets were in place. 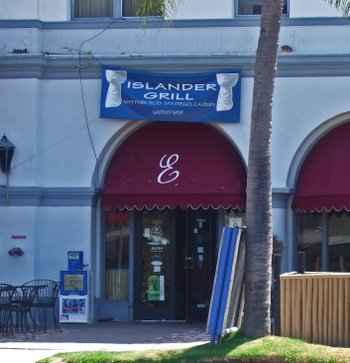 The service at Islander Grill has always been nice and friendly, and though things move at a careful cadence, I've always felt very relaxed here. Don't let the picture fool you, this is a lot of food. The Styrofoam bowl is stuffed to the gills with Kelaguen Mannok, packed on top of a generous portion of rice. I was first introduced to this dish featuring chopped grilled chicken, green onions, lemon juice, and red pepper by a Guamanian co-worker back home. 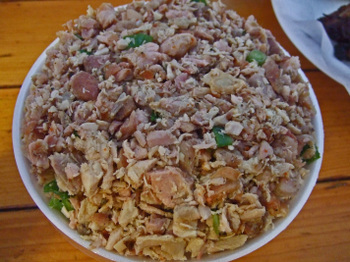 During one of our "cook-outs", his visiting Mom brought over a tray of Kelaguen. This version really doesn't hold a candle to "Mom's", or even Santos's wonderful looking version you can find here. The Kelaguen at Islander Grill is also missing a key component....that would be grated coconut. What makes this Kelaguen tick, is the Finadene, the salty-slightly spicy-tart-sour sauce that brings life to the Kelaguen, or almost anything else for that matter. As you keep digging away at your Kelguen, you'll start noticing a few things. First, you'll realize after a few large spoonfuls, that you've hardly even put a "dent" in your dish. Second, you'll notice that the heat will slowly get to you, until your brow is in need of some attention from some napkins. The Kelaguen at Islander Grill is served either cold or pretty close to room temperature, and with the hot rice, and Finadene, it is a winning combination. 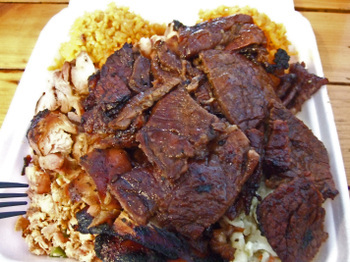 A choice of 2 proteins, either BBQ Beef, BBQ Chicken, BBQ Short Ribs, and Pork Ribs, a scoop of Kelaguen, either Macaroni or Cabbage Salad, and either White or Chamorro Red Rice. Whew, that's a lot of food! Guamanian BBQ is on the mild side, and the meat tens to be dry....so much better for the finadene. This was so long ago, that I don't remember much about the macaroni salad, other than it was a bit too "pickly" for me. The red rice was fine....basically calrose rice colored with achiote, no onions or anything else to impart much flavor other than salt. If you though this looked like a massive plate lunch, you wouldn't be too far o ff. Talk about needing a nap! 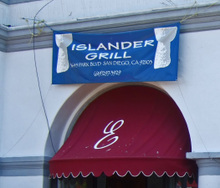 I recall that when Islander Grill first opened up, there were a few more items on the menu....various stews and such. But over time, the menu has been pared down to salads, fried items (i.e. Lumpia and Empanadas), BBQ, Pancit, and of course, Kelaguen. I've also found that even though the hours posted says they open at 11 am, on some days they don't open until noon. You'll need to find parking on Park Boulevard, which is not problem during week day lunch hours, but evenings and weekends can be a challenge. Still, if you need your Kelaguen, you know where to get you fix.